Azon Recruitment Group is an award-winning recruitment agency, and one of Ireland’s fastest growing talent providers. Your career is our focus: we specialise in sourcing the best talent on the market both locally and internationally. With a wealth of experience across multiple industry sectors, Azon connect employers to the perfect people they need to grow their business. Ronan Colleran is the CEO of Azon Recruitment Group, and leads Azon's Executive Search business AES International. Ronan is a Big 4 qualified Chartered Accountant (Arthur Andersen) who has been working in the recruitment industry for over 17 years. Having built and sold a recruitment business from 2001-2007, he then immersed himself in a large International Recruitment Group where he led and grew the Executive Search arm, and was key contributor for the provision of high-volume client recruitment project solutions for the Group. He founded Azon Recruitment group in 2014 with the ambition of growing a business together with his colleagues into something to be proud of. Day-to-Day, Ronan manages Executive Search assignments for a core client base who trust his judgement and recognise his passion for securing the best possible executive appointment for their business. Ronan holds a Bachelor of Commerce Degree from National University of Ireland, Galway (NUI Galway) and completed a Master of Accounting Degree from University College Dublin. Ronan is a former member of the Governing Authority of NUI Galway. Ronan cycles to work to beat the traffic and is threatening to make a comeback to tennis and to fix his ridiculously fast golf backswing someday. Caroline Bruno is a Partner within AES International. In her career to date she has gained an in-depth understanding of the UK and Irish Banking and Financial Services landscape, a market she has worked in for over 18 years. As Head of Executive Resourcing for Barclays Bank Plc UK, Caroline managed the delivery of C-Suite and senior hires across the Corporate, Private and Retail business platforms. Caroline joined Azon Executive Search as a Partner and Brexit Client Advisor supporting UK based Financial institutions who are considering relocating operations to Ireland. Married to an Italian pastry chef, Caroline has access to the best artisan pastries in Ireland which everyone at AES International enjoys during our weekly office coffee morning. Caroline holds a BA in PR from Bournemouth University. Within Azon, Nabil McNaughton leads a talented team of Consultants that specialise across the financial services landscape. Nabil brings direct experience having worked with JP Morgan and State Street coupled with over 10 years’ recruitment experience. Nabil has forged strong relationships with the top international Funds & Asset Management firms operating from Ireland. In addition, he is adept at keeping up to date with regulatory changes impacting on the Funds industry globally and hosting networking events relevant to these developments to inform thinking. Nabil holds a Bachelors Degree in Economics from University College Dublin. While formerly a competitive rugby player of note, Nabil is now more of an armchair warrior! With over 18 years’ experience working on the financing and investment portfolios of Irish and International businesses, Gillian O’ Dowd has extensive experience from startup to exit, from growth to M&A across investments, property & recruitment sectors. Gillian’s early career in Allen McGuire provided a unique insight and experience of mergers, acquisitions, assessing market valuations and opportunities. Gillian has also held a variety of financial roles at Goodbody Stockbrokers, Savills, IBI Corporate Finance, UK-based West Properties & Citadel Corporate Finance. Gillian holds a Bachelor of Commerce from UCC and a Masters in Financial Services from the Michael Smurfit Graduate School of Business, UCD. In her spare time, Gillian volunteers with a number of Charity organisations in Ireland on Patient Support programs. Michael Costello is the Managing Partner and Co-Founder of the Azon Capital Markets arm of Azon Recruitment Group alongside Ronan Colleran. Azon Capital Markets was established in 2018 in response to increasing client demands for front office expertise in Ireland. Michael has a degree in Finance & Economics from Trinity College Dublin and over 10 years experience working as a Trader on the buy and sell side in London across Investment Banks and Hedge Funds. Within Azon, Stephen Hoban leads a dynamic team of Consultants that specialise in the recruitment of Construction Professionals. Stephen has extensive recruitment experience in the industry having worked for the past 5 years with a specialist Construction Recruitment company prior to joining Azon Recruitment Group. Stephen has a degree in Quantity Surveying from IT Sligo. A Mayo native, Stephen can usually be found cheering on his team at Croker, though it doesn't seem to do them much good! Ruth Lyndon oversees Azon's Legal recruitment division covering both Legal professional and related roles within Ireland. Ruth qualified with "Big 5" law firm A&L Goodbody where she spent over 6 years. She then moved to the international law firm Maples and Calder for close to 2 years during the early stages of their development in the Irish market. Ruth has an excellent academic record holding First Class Honours in both her Bachelor of Corporate Law undergraduate and Bachelor of Laws LLB postgraduate degrees from NUIG. Ruth is acknowledged as being the most bubbly Lawyer to have ever emerged from any Top 5 Law Firm globally. Kevin Halligan is an experienced Financial Services professional with specific expertise in Banking, Fund Operations and Asset Management. Kevin gained excellent client relationship and people management experience during his earlier career with Bank of America Merrill Lynch and an Irish Stockbroking Firm. Kevin leads the Funds specialists within Azon Recruitment and for the past 3 years has focused on placing high calibre Funds and Asset Management candidates both in Ireland and Internationally. In his spare time, Kevin is a long suffering West Ham fan. James Alexander has 8 years of technology recruitment experience in both Australia and Ireland, and leads Azon’s Emerging Technologies division. James Alexander supports our Clients in their Digitisation and Automation journey through sourcing the top AI, Machine Learning and Robotics Process Automation talent in the Irish market. Prior to joining Azon, James led a Specialist Digital Recruitment team in Melbourne, and holds a Bachelor of Science in Business Management from DIT. Ronan Farrelly leads the Accounting and Finance Division at Azon. Prior to his career in recruitment, Ronan qualified as an ACCA in Practice. He has recently returned from London where he spent 14 years working for a FTSE250 recruitment business and London’s largest independently owned financial recruiter. He specialises in Professional Services recruitment and has worked on volume recruitment assignments with the Big 4 and Top 100 accountancy firms. 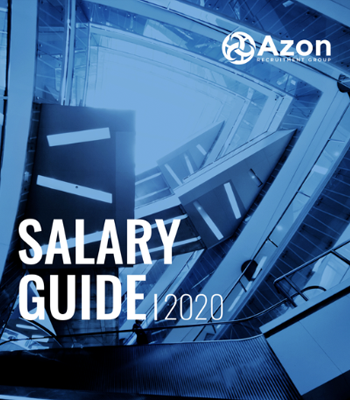 At Azon, Ronan recruits from newly qualified to Partner level. Jean Ward is Azon's Learning & Development Specialist. Jean began her career in Human Resources and Training & Development, developing strong interpersonal skills and a detailed understanding of staffing and hiring processes before moving into recruitment. Skilled in Talent Management, Retail, Organizational Development, Succession Planning, and Recruiting, Jean now deploys these skills to provide outstanding support and guidance to her clients and candidates alike. Rory leads our Business Transformation division delivering mid to senior level change professionals across all industries and professional services. With over 7 years recruitment experience, prior to joining Azon, Rory held a managerial position with a global recruitment brand based in London. He is a part-qualified accountant and holds a Bachelors Degree in Business Studies from the University of Limerick. An avid Munster Rugby supporter, Rory is also a keen rower having competed a number of times at Henley Royal Regatta. Gillian Scanlan is a Senior Consultant within Azon's busy Financial Services desk. Following University, Gillian moved to Spain and Australia to teach English. While in Australia she began working as a Sales Associate which led her on her path to recruitment. She joined the Azon team in 2017 as a Recruitment Consultant specialising in Accounting, before being promoted to Senior Consultant for Financial Services in Q4, 2018. Gillian graduated from Trinity College Dublin with a 2.1 Honours Degree in Political Science having spent one year studying abroad on an Erasmus Programme in Sweden. Gillian also gained experience as a Volunteer Aid worker in Vietnam working with disabled and orphaned children. Tony Barry is a Senior Consultant within Azon’s Construction Team. He graduated with a Bachelor of Arts from NUIG and has worked in the recruitment sector for the past number of years. He specialises in Construction and Engineering related roles for clients varying from small construction firms up to large multinational corporations. Tony is well traveled and has lived and worked in both the Middle East and North America. Tony is a key member of the social committee, a former Irish dancer in his day and a cat lover - he volunteers at the ISPCA. David Harrington is a Senior Consultant within the Accountancy team at Azon with an expert focus on Tax. Prior to spending a year recruiting for Financial Services within the Australian market, David worked as a Chartered Tax Adviser for both PwC and Grant Thornton in Dublin. During this time, David worked with companies in a diverse number of industries including retail, manufacturing, pharmaceutical and technology. David is an Associate member of the Irish Taxation Institute and holds a 2.1 Honours degree in Law and Economics from the University of Limerick. Corrina Noonan works within Azon's market leading Financial Services team. Corrina joined Azon having spent over five years recruiting internationally. Most recently Corrina worked for a leading international bank in Canada where she was recruiting internally for the retail arm of the bank. She holds an Honours Degree from L.I.T. in Business Management. Outside of work Corrina likes to spend her time outdoors and with family and friends. Within Azon, James Mackey has an expert focus on the Insurance and Banking area. Having spent over 2 years recruiting for Financial Services within the Australian market, James returned to Ireland within Azon Recruitment in 2017 making an immediate impact with his ability to understand his client needs and match them exactly with candidates. In his earlier career, James gained experience working within a large Irish Business Process Outsource provider, Abtran, where he worked for over five years progressing to Manager level overseeing a team of 23 people. James holds a Bachelors Degree in Business Studies majoring in Marketing from University of Limerick. James is a former hurler of renown in Limerick (at underage levels) and is ecstatic following the end of their 45 year hiatus to bring the Liam McCarthy back to his home county ! Lisa McCarthy is a Senior Consultant within Azon's Legal team. After graduating from Queen's University, Belfast with a B.A in Politics and International studies (Hons. ), Lisa secured a position with an international recruitment agency specialising in Legal recruitment in both Dublin and New York, at all levels across both industry and practice. Lisa has a total of 4 years specialist legal recruitment experience and currently specialises in qualified legal and company secretarial roles in both industry and practice. Lisa is a professional, experienced and highly personable Legal recruiter expertly placed to service her clients' and candidates' recruitment needs. Seán Feighery is a Senior Consultant on Azon’s Construction & Engineering team. He graduated with a BSc in Business & Arts Management. Seán has extensive experience having specialised in the recruitment of Construction professionals with Contractors and Consultancies across Ireland, UK & Europe. In his spare time Seán enjoys travelling, football and festivals. Clíodhna Lynch graduated with a Bachelor of Commerce from UCC, having gained prior experience in the Audit Sector at Deloitte. Clíodhna is part of the Financial Services Team in Azon, and recruits for a range of departments within, including Financial Services, Credit and Accounting. Although a great lover of Kerry football, Clíodhna has spent the majority of her own football career keeping the sub-bench warm. She also enjoys playing the concertina and travelling in her spare time. Rory Bourke is a consultant within Azon's Legal team. After graduating from the Limerick Institute of Technology in 2016 with a Degree in Marketing & Management, Rory moved to New York for a year. Upon returning home, a keen interest in sales and business development led Rory to begin a career as a Recruitment Consultant. As part of the Legal team at Azon, Rory specialises in Legal support roles such as Paralegal, Legal Executive, and Legal Secretary positions in both practice and industry. A Limerick man, Rory is a proud Munster supporter even amidst his competitive Leinster colleagues. Holly McFadden is Azon's Creative & Technology Lead and has 6 years recruitment experience across both the Australian and Irish markets. Holly is a Psychology graduate and also holds a post grad dip in HRM from Griffith University. When she's not at work Holly can be found on the Jiu Jitsu mats preparing for her next competition (she enjoys choking people out in her spare time and winning medals). Animals are her friends - she doesn't eat them! Keith O’Donovan is a consultant within the Accounting & Finance team at Azon with an expert focus on practice. He is an existing member of the Association of Chartered Certified Accountants (ACCA). Prior to joining Azon, Keith worked for 11 years as a Senior and Business Advisor with two well established practices in Limerick city, Horwath Bastow Charleton & O’Donovan Lavin. He has extensive knowledge in dealing with SMEs, Limited Companies, Partnerships, Start-Ups & Sole Trades under the heads of Business Advisory, Corporate Recovery & Insolvency, Corporate Finance, Tax Planning & Working Capital requirements. Keith is an avid Munster fan. When he can’t be found roaring on the men in red in Thomond Park, he is often trying to lower his handicap on the golf course. A lover of the sea, Keith is a qualified rescue diver and a past voluntary member of Kilkee Marine Search & Rescue Service. Conor Blake is a consultant in Azon’s Construction, Property & Engineering team specialising in the recruitment of all property related roles. Conor has international experience in the recruitment industry, having recruited Sales and Marketing professionals in Australia before moving home to Ireland. Prior to this Conor worked in the property industry in Ireland and Australia for 8 years, helping him gain a good understanding of the challenges faced by clients and candidates in the industry. Conor completed a Higher Certificate in Property Studies from DIT and is a qualified property valuer. Daniel O'Connor is as a Marketing Executive for Azon. He graduated from DCU with a Bachelors in Communications, also having studied at Simon Fraser University in Vancouver, Canada. Previously having been at Iconic Translation Machines and Perigord Life Science Artwork Solutions, he primarily worked in content creation, social media management and digital marketing. He spends most of his time talking to people smarter than him and turning those chats into interesting things to read or watch. Morgan McDonagh is a Senior Consultant within Azon's Compliance team. After graduating from the Smurfit Business School with a Masters in Management, Morgan secured a position with State Street. He worked there for five years across both first and second line Compliance. Morgan secured a position with an international recruitment agency specialising in Compliance , across all industries. Morgan has a nearly 3 years specialist Compliance recruitment experience and will focus on both Compliance and Risk here in Azon. Genevieve Davis is a consultant within Azon's Banking Team. Genevieve holds a Bachelors Degree in Business Studies majoring in Accounting from the Institute of Technology, Tallaght. She moved to Australia where she furthered her studies with a Diploma of Management from Australian Pacific College and traveled around Down Under. As part of the Banking team at Azon, Genevieve specializes in recruiting Banking Operations & Credit Professionals. Shane Lannon is a Consultant within Azon's Construction Team. After graduating from the National University of Ireland Galway (NUIG) with a Bsc in Health & Safety Systems, he then went on to pursue a Msc in Fire Safety Engineering at Ulster University. Shane worked with the Health & Safety Authority (HSA) for a period of time before he secured a Fire Safety Engineering position with WSP | Parson Brinckerhoff in Dubai. He worked there for six years before taking a year out in Vancouver Canada. Shane has joined the Azon team to transfer his in the field skills to assist people in finding positions for Health & Safety, Fire Safety Engineering amongst other roles within the construction industry. Join the Team - Apply Today! At Azon Recruitment Group, we are always on the lookout for budding talent and professionals that excel in their chosen industry. If you think you have what it takes to become part of a dynamic, ambitious and hardworking team get in touch today.